There are many factors that may cause cloudy or turbid water. The most common causes of turbidity are organic matter, and/or colloidal solids that are too small and too fine to settle out properly. These suspended particles can cause problems with disinfection processes, and can also be an indicator of bacterial activity in water. Turbidity is measured in NTU’s, (nephelometric turbidity units). The turbidity of drinking water should always be less than 1 NTU. Most treated city water is less than .2 NTUs. Testing for turbidity is done with the use of a special instrument called a turbidimeter. While most homeowners on well water can forego testing for turbidity since it is easily observable in the water, municipal water systems are strictly regulated and tested frequently for turbidity. If you desire an accurate reading of your water’s turbidity in NTU’s, you can use our WaterCheck test kit. Once you’ve verified your water’s turbidity, you’ll have a few treatment options. These include flocculation with alum followed by filtration, ultra-filtration, reverse osmosis, or even just installing a whole house cartridge filter. The flocculation method is perhaps the most popular, and is also the method used by many municipal treatment plants. To treat turbidity in this way, a compound called alum (aluminum sulfate) is injected into water in just the right amount to induce flocculation. Flocculation is the process by which particles join together to form larger masses that can be filtered more easily than tiny, free-floating particulate. Once flocculated, the turbidity-causing sediment can be filtered by a backwash filter, resulting in clean, clear water. The other option is to get an ultra-filtration system, which will filter your water down to .02 microns, leaving only naturally occurring minerals. A UF system will be very effective, but should be preceded by a pre-treatment system such as a sediment backwash filter to protect the UF system’s membrane from large sediment. A reverse osmosis system, which purifies water by reversing osmotic pressure and forcing salt water and pure water into two separate streams, will be similarly effective but also require a good pre-treatment system for protection of its membrane. 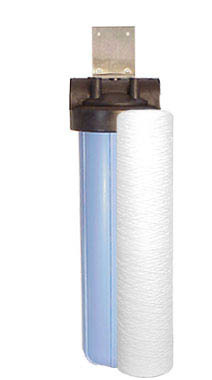 Finally, the lowest-cost option for treating turbidity in your water is to install a whole house cartridge filter. These are more effective when installed after a sediment backwash filter, but can filter sediment fairly well by themselves. A 5 micron system is recommended at the least, though a 1 micron system would be preferable. Check out our website for more info on turbidity, and browse our online store for all of the treatment options we’ve just covered.